Is the rail of the stairlift fixed to the wall? No, all our stairlifts be it straight or curved are fitted to the staircase this is because it is a lot safety as when it is connected to the wall it could pull away and even fall which could damage yourself and even the structure of your home. The brackets which hold the rail are screwed onto the steps allowing installation within homes which have plasterboard and non-supporting walls. Why does the stairlift need batteries if it is plugged into the mains? When the stairlift is running up and down the rail it in running on the batteries which are positioned under the seat. 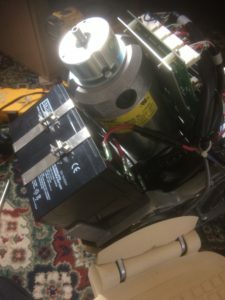 The part which is connected to the mains is the charger for the batteries which charge up when the stairlift is positioned at the top or bottom of the rail. Because the stairlift runs on batteries you can still use it a couple of times in a power cut providing emergence use. What happens when the stairlift brakes down? Give us a call as soon as you can, even if it’s just making a strange noise as this could lead to more damage and worst of all a total brake down. We will make an appointment for one of our highly industry trained engineers to come round and get you up and running again as soon as we can. When you do give us a call please provide us with as much information as possible as this will give our engineers the opportunity to get some parts if required to fix it. Does someone need to come out and measure the stairlift first? 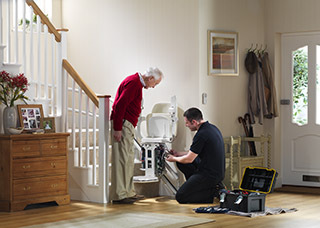 Straight stairlifts can be installed within one to two working days, this applies to both new and second hand models. Curved stairlifts take a little longer as the rail needs to be made, this normally is around two weeks. Installation on both straight and curved is normally within half a day, allowing you to use your new lift as soon as possible. What guarantee do I get with my stairlift? Do you offer warranties or service contracts? New Brooks stair lifts come with 12 months warranty and new Stannah stair lift comes with 2 years warranty and a free 12 month service ensuring your lift is running perfectly. We also supply second hand stairlifts which we provide a year’s warranty. 1stStep Mobility also provide a Three Year Extra Warranty cover for only £495.00, which entitles you to priority on call out and breakdowns, Annual Service and covers the cost on labour, parts and call outs*. For more information and to see if your stair lift is entitled to this fantastic offer then give your local 1stStep Mobility shop a call today. What do you get when you have a yearly service? We carry out a thorough inspection, lubricate all required parts following a 29 point checklist that covers important safety checks ensure that it is all correctly working and will advise you on anything which will need replacing in the near future. A copy of this checklist will be given to you for your record. If you stairlift is a Brooks or Acorn straight stairlift or a Stannah straight or curved then we are more then happy to help you, just give your local 1stStep Mobility a call today. What happens if I bought a stairlift, but it is no longer required? Give us a call as we can discuss the options available to you, If we supplied it to you then we may be able to buy the carriage back but the rail whether it’s a straight or curved has been specifically made or cut for your stairs and is no longer useable so we can remove it and recycle it for you. We can sometimes remove stairlifts which have been installed and supplied by other companies but it would be chargeable, please give your local 1stStep Mobility a call for more details. If any of these question have not covered what you wanted to know please contact your local 1st Step Mobility shop today. * The cost for parts will only be covered under general wear and tear, if the product is damaged due to miss use then the user will be invoiced for the damaged caused.